That's precisely what I think is happening. The ChargePoint unit is lowering the pilot during the pause, causing the car to resume charging at a reduced rate. It must be only certain ChargePoint units as I've never experienced anything like this and I frequently use their chargers. ChrisEV wrote: It must be only certain ChargePoint units as I've never experienced anything like this and I frequently use their chargers. Or maybe your battery is in a state where the BMS doesn't decide to do the pause. coulomb wrote: I shared this earlier. ... This pause? Oops! That is indeed a pause, which I should have checked for. My mistake that's not actually a ChargePoint charger, it's a company that has a partnership with them and you can use your Chargepoint card to start a session. I only see such spikes with their chargers. Here's an actual Chargepoint charge session from a dual head charger. 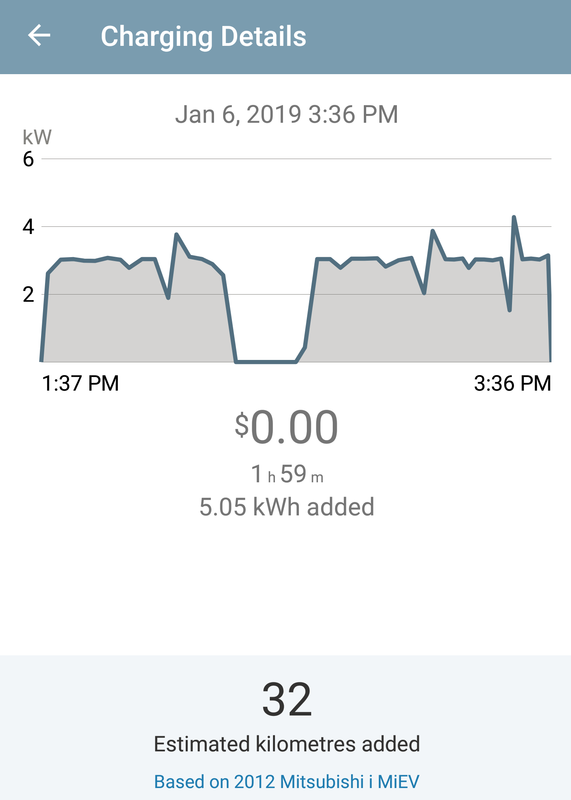 I've pointed out to Chargepoint that I do not see low kW charging after the pause at home, and I have pointed out that re-initializing a Chargepoint session gets immediately back to the good 3kW rate. It is coming out of the pause where the charging seems to get stuck at 1.1kW. Below is Chargepoint's latest response, where she recommends that I get Mitsubishi to fix the problem of low charging rate. She also recommends I try a different brand of charger (besides home) to see if the 1.1kW rate also happens there. But I'm having a hard time psyching up for paying 3 cents per minute, where 12 miles worth of charging would cost $1.80. Since the drop does not always happen, it might end up being a $25 experiment, and I'm not even sure EVGo provides graphs. Does anyone know of a contact at the Renault–Nissan–Mitsubishi Alliance that could help with this apparent 'lack of proper handshake after pause' problem? Thanks for all that info - the amount of detail was amazing! After further troubleshooting the stations you used, we found that none of the other vehicles who have used those stations have experienced the same issue. I also consulted with one of my colleagues, and we think it may be the vehicle's battery management system that is causing this whereas the vehicle's BMS drops the voltage down extremely low, to where it finds a steady sine wave, or is comfortable, and then has difficulties building back up. If it's not too much of a bother, I would encourage you to try out another manufacturer's stations to see if you receive the same results. If you do receive the same results, it's definitely the vehicle's BMS, and Mitsubishi should be able to offer further guidance on possible solutions. 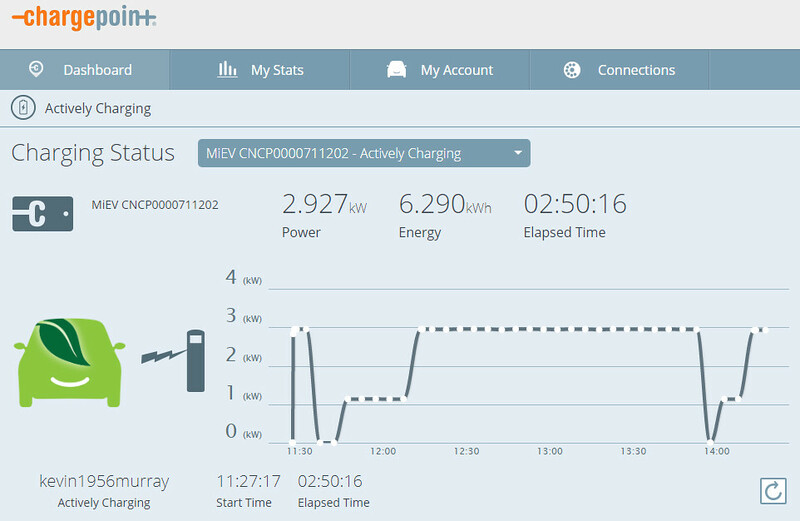 I have found that when a MiEV is stuck at a ChargePoint charging rate of just 1.1kW (after each pause), then calling ChargePoint and asking them to reboot that station (remotely) will get the charge rate back to 3kW. So now bets can be placed on how long it will take them to get tired of that, and maybe eventually actually understand and fix the problem of low charge rate after MiEV pauses. Below is today's charging trace. 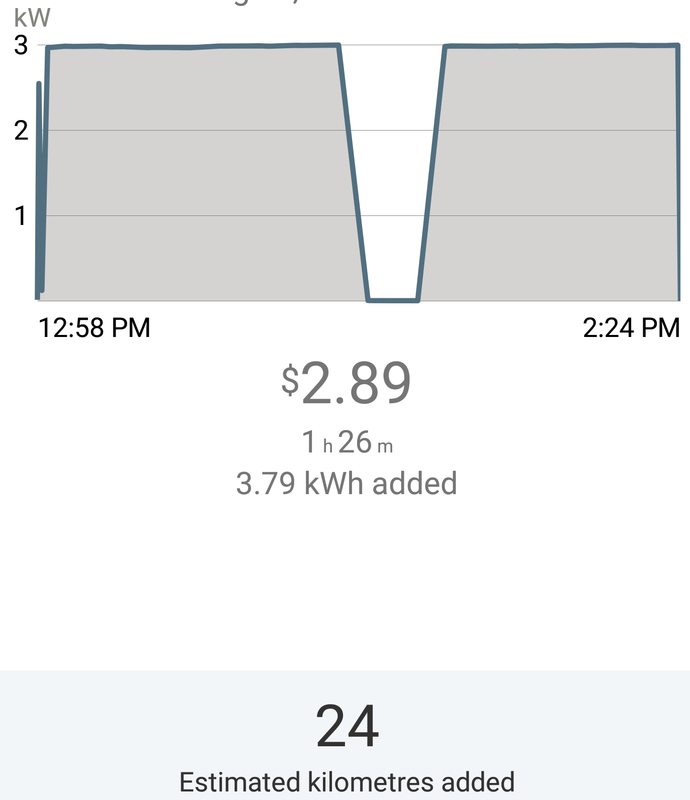 Each upswing back to 3kW is due to my calling Chargepoint to get them to reboot that station. Below is an email I just got from ChargePoint. The issue of slow charging after the pause has been escalated, hopefully to someone within ChargePoint who understands pilot signals and possible interactions with MiEVs. Thank you for your patience in this matter, and the extensive research you provided. I have compiled all the data you've shared with me and gone ahead and forwarded this matter to our software and product management teams to research further. I'm unable to provide a time frame for the fix at this time as it's still under review, but I do want you to know the matter has been escalated and our teams are aware and looking into the matter.